Venus’s atmosphere, taken by the Venus Monitoring Camera (VMC) during Venus Express orbit number 465 on 30 July 2007. This story was updated at 11:20 a.m. ET. 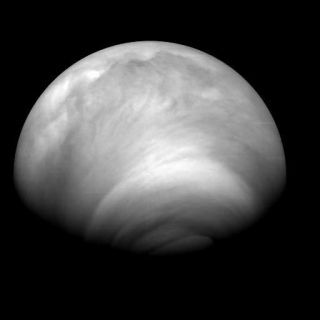 Venus is made of the same stuff of Earth, but is bone-dry, hot enough to melt lead and has a chokingly thick atmosphere. It even spins backwards. Astronomershave spent decades trying to explain Venus' mysterious properties. Now onescientist thinks the planet's formation may explain all: Two huge, protoplanetary bodies collided head-on and mergedto form our planetary neighbor, but obliterated nearly all water in the process. "Theprobability that two protoplanets collided to form Venus is not at allimplausible," said John Huw Davies, a geodynamicist at Cardiff University in the U.K. who developed the idea. A majorityof scientists think Earth's moon formed when a protoplanet about the size ofMars smackedinto the planet at an angle. Davies thinks Venus was born of a far worse cosmictrain wreck. "Whatif the moon-Earth collision isn't that big in planetary terms?" Daviestold SPACE.com. "A head-on blow between two similarly sized bodieswould have been about twice as energetic." Astronomershave had little time to react to Davies' proposition, which is detailed inrecent issue of the journal Earth and Planetary Science Letters, butalready some are wary. Despite the cautionary responses from other scientists,Davies thinks his idea is worth exploring. Earthharbors an enormous volume of water, even in its searing interior. Thelife-giving molecule emerges as a vapor with molten lava, carrying with it aradioactive gas known as argon-40. The isotope is generated from radioactivepotassium deposits inside of our planet, as well as in Venus. Daviesthinks the relatively low amount of such argon detected in Venus'atmosphere — about 400 times scarcer than on Earth — is a sign that waternever really seeped out of the parched, volcano-covered planet. "Theonly way water could have out-gassed is very early in Venus' history,"Davies said. "The argon-40 gives us a timescale of water leaving theground because it's produced over time, and only a little of it has beenreleased." Amega-collision between two bodies of roughly equal size could have provided theenergy necessary to rip water, which is made of two hydrogen and one oxygen,into pieces. The hydrogen would escape into space while oxygen would bond withiron and sink to the planet's core. Althoughthe Earth suffered a catastrophic impact that formed the moon, Davies explainedthat the process did not dry out the two bodies. "Itwasn't as energetic, limiting the reaction of iron and water," he said. TobiasOwens, a planetary scientist at the University of Hawaii, thinks Davies has"swept deuterium under the rug." This form of hydrogen gas, Owensexplained, can form high in a planet's atmosphere when ultraviolet sunlightbreaks apart a water molecule. "Whena Venus probe sent back readings of deuterium on the planet, everybody wasastonished," Owens said of a Russian Venus lander mission. "There wasa huge fraction of deuterium 150 times greater than you see on Earth. You haveto explain that." Owens andother scientists argue that at 836 degrees F (447 degrees C), Venus' surfacewould have instantly baked water into vapor and pushed it into the upperatmosphere, where sunlight is two times more intense than at Earth. Over time,he said, the water would degrade. Davies,however, said a lack of molecular oxygen — the same type we breathe — producedby the photo-degradation process does not support such an origin of deuterium. "Venushas virtually no oxygen, whereas Earth's atmosphere is about 20 percentoxygen," Davies said. "If not trapped in the atmosphere, then rockswould have to absorb it." And evidence from Venus, he said, does notsuggest that this is the case. Another cluethat Davies said gives his theory legs is the odd rotation of Venus. Theplanet rotates in a clockwise or retrograde direction, which is theopposite spin of every planet in the inner solar system. "Another peculiarity isthat it has no moon," Davies said. "If the head-on impact I'vehypothesized was a little off of the mark, it could explain Venus' retrograderotation without making a moon." AlanBoss, a scientist at the Carnegie Institution in Washington, D.C., thinks massive collisions — including head-on mergers — were the norm for terrestrial plants early in their histories and could explain our sinistertwin's backwards habits. "Venus must have suffered a giant impact during its formation, as did all the terrestrial planets. That is how the final phase of terrestrial planet formation occurs," Boss said in an e-mail. "This could have been a head-on impact, which might not have produced a moon, or it could have been an off-center impact, like the impact that led to Earth's moon." If the latter was the case, thenwhere is Venus' moon? Boss explained that if a Venusian moon formed via a giant impact, its orbit could have decayed and spiraled the body into the planet's surface. Daviesthinks the simpler explanation is his own. "Ofcourse it is possible, but it is unclear whether it is probable," Daviessaid. Whatever the case, Davies, Boss and most other scientists think bigcollision events were common in the solar system's formative years. Aside from planningto create a detailed computer model for the hypothesized mega-collision, as hasbeen done for moon formation theory, Davies said another way to test hisidea is to send a new spacecraft to Venus. Russia's space program successfully landednearly 10 spacecraft on Venus' surface in the 1970s and 1980s. But Davies saidnone of them scouted for water-containing minerals such as mica — evidence thatwould challenge his hypothesis. "Theymade remote chemical measurements of the surface," Davies said, but noneindicated hydrated rocks. "If a new spacecraft finds a lot of hydratedminerals, it would show there is still abundant water on Venus. Then myhypothesis would be out." Spacecraftthat have recently encountered Venus can't detect such minerals from space, hesaid, because of a layer of reflective hydrogen sulfide in theatmosphere. "Arover of some sort could scout for such minerals before it fails from theintense heat, or maybe a satellite below the hydrogen sulfide [layer]," hesaid. Boss,however, said even detecting such minerals might not rule out a collision. "Water can always be added as a 'late veneer' by ? icyplanetesimals that helped finish building the planet," Boss said, althoughDavies thinks comets and other such bodies could only deliver a small amount ofwater to the planet. Even if hydrated rocks on Venus' surface could rule out acataclysmic formation, other data could provide better clues to the planet'sorigins, Francis Nimmo of the University of California Santa Cruz thinks. "There a lot of things that would be very nice to do onVenus, like put a seismometer on the surface," said Nimmo, a planetary scientist. "The reason we know anything about Earth's interior is from suchdevices." Whether or not someone launches a new spacecraft to scoutout Venus' surface, and whatever its scientific mission is, Davies said it willhave to investigate quickly. "You have to take all of your measurements before thelander, or whatever it is, quite literally burns up," Davies said. "The longest any spacecraft has lasted is less than two hours."